Egypt's President Abdel-Fattah El-Sisi has said that the upcoming economic reform measures will not be as harsh as those that have already been implemented in the country. The president made the comments in a speech during a celebration of National Police Day on Wednesday, where he praised and saluted the Egyptian people for enduring the hardships brought about by the country's austerity measures. During the ceremony held at the Police Academy on the occasion of the 67th National Police Day, which also coincides with the 8th anniversary of 25 January revolution, President El-Sisi honoured the families of Egypt's martyrs, including police officers. The president also announced the launch of a website and mobile application for the Egyptian police, which will provide electronic services to citizens. "The economic reform programme was undoubtedly harsh, but it was a decisive response to the challenges and circumstances that had led our economy to the situation it was in," El-Sisi said. "In November 2016, we had to make one of two choices, either face the hard economic situation or to leave it as is. The decision was to face this situation with an economic reform programme studied by experts and specialists." "Changing the exchange rate from EGP 9 to the US dollar to double its price put stress on Egyptians. These harsh measures were the sole treatment to overcoming this challenge in a scientific and realistic way," El-Sisi said. "There was no other way, because the second way was losing the state," he added. President El-Sisi also said that the challenges faced by Egypt in recent years have been some of the most difficult in its modern history. "For the past few years, we have faced great difficulties and challenges, perhaps the most serious in our times, represented in attempts by forces of darkness and evil groups to hinder our path and terrorise our safe society," El-Sisi said. 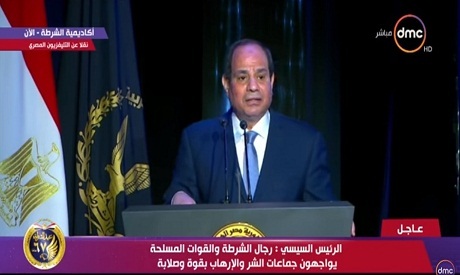 "To these evil forces I say that the Egyptian people, through wisdom developed over thousands of years and with their trust in the efficiency of their police and Armed Forces, are able to distinguish between right and wrong," the president added. El-Sisi affirmed that the state will continue to carry out its duties on all levels, which involve combating terrorism, reinforcing the rule of law, empowering state institutions, achieving comprehensive development and promoting the principles of tolerance, coexistence and citizenship. "On this day, I would like to extend my salutations on the occasion of the 25 January revolution, through which the Egyptian people expressed their aspiration to build a new future for this country, where all of its people enjoy a decent life," El-Sisi concluded. Before the president's speech, the Minister of Interior Mahmoud Tawfik gave a short speech where he said that the police will not tolerate anyone raising arms against the Egyptian people.